Our friend brought his hammock along and gladly posed in it for me in front of our campsite. Five of us went kayaking/camping to Newcastle Island just across from the Nanaimo Harbour. This small island, all of which is basically a BC provincial park, is just a stone’s throw from the city of Nanaimo. 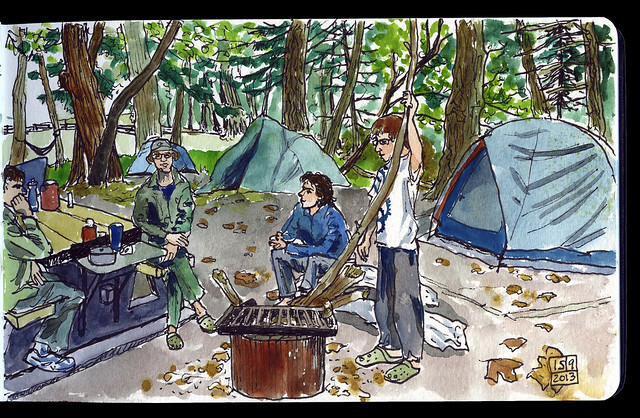 It would have been a lovely, quiet, late summer camping weekend if it hadn’t been for some young yahoos who occupied a campsite nearby. They partied all night, singing the Pokemon song and other campfire favourites. I wanted to like them, their singing wasn’t even bad, and they were having such a good time, but I just couldn’t with all their noise, all through the night. Surprisingly, they didn’t seem to be getting drunk on beer, but mostly high on sugared drinks, as we figured out when we saw their pop bottle trash all over their campsite after they left. We paddled around a couple of islands and walked all over Newcastle Island, learning about its coal-mining and sandstone-mining history in the process. Some cool rusty industrial pieces of equipment are still sitting around, like a sandstone cutter, and an airshaft for the old coal mine, looking like something out of the industrial age in the game “Myst”, or something out of a steampunk novel. I would have loved to have time to draw one of those items too, but everyone waited up for me several times for the drawings I did do. Unfortunately, there was a bad ending to our weekend: when we paddled back to the Nanaimo Harbour, where we’d rented the kayaks, my sister’s car had disappeared from the nearby parking lot. Local towing companies didn’t have her car, so she reported it stolen to the police. Now we are all waiting to find out if the car turns up. I am getting faster at these drawings, it seems to me this one only took 30-40 minutes after our pancake breakfast, but it may have seemed longer to my party, since they all waited around for me to finish drawing them. I somehow made my sister (second from right) look like a boy, and my husband (second from left) look like a girl. And my sister’s husband, on the right, looks like a kid in this drawing. He loves to throw giant pieces of wood on the campfire. This sketch documents his bonfire approach. He also wanted to make sure I drew the pattern on his T-shirt, which is a print of cogs that he inked up and printed onto the shirt. The only one who looks a bit like himself is our friend on the far left. On our way back to Nanaimo to return our rental kayaks we paddled by the Dinghydock, which is a floating pub/restaurant just off Protection Island which was the next island over from Newcastle Island, where we were camping. They have a low dock specifically for their kayaking guests. I did this drawing in about 15 minutes, so the perspective is really off. I find it quite fascinating what happened here as I was drawing from left to right. My sister’s husband on my left looks very tiny compared to our friend on my right, but they were both seated at the same distance from me. Somehow my friend became a giant. A friendly giant, I might add.